Home / bangladesh / The police took BCL to BCL and OC said I was taking BNP. The police took BCL to BCL and OC said I was taking BNP. Police chief Akhter Hossain was detained by the BCL leader and knocked out two police officers in Arazymear in Narayanganj. Activists in the Chhatra League were actively involved in the Gopaldi police investigation center in upazila, but OC denied the incident occurred at Nazrul Islam Babu College. did. There was a controversy between them. At the same time, OC Akhter Hossain, who asked journalists not to disclose news about the matter, also made obscene remarks about the attacked police. OC said the BCL leaders had arrested their own people and "tomorrow MP went to Saab America. BNP was a single act on their own and they were able to take action." On the other hand, police ASI Mamun threatened that Chhatra League leader Sujoy would kill him and two other police officers who were assaulted at the investigation center and threatened to kill them. Meanwhile, police officers were all angry and police officers were hit by attackers. Before March 29, a group of BCL leaders went to the police station to commit abuse and to join the police. The video of the incident was viral in social media, but the police did not take legal action against BCL leaders. The local police arrested the dinar Islam, the son of Jamaluddin in the village of Ramchandra, in Gopaldi Bazar, in Ghazaljira on drug-related incitement and tricks last Friday . After receiving information on his arrest, Sujoy Saha, Gopalpuri City Secretary General, went to the investigation center to overtake the arrested Didar. Sujoy smiles in a dirty language when the police refuse to leave him. When ATS Mamun protested at that time, Sujoy of Chhatra League beat him and started to beat him. Sujoy took a colleague to the police station and attacked the police. Constant Imran and Bashar were also attacked. Upazila Police Officer Akhtar Hossain informed the police, took control of the situation, detained Sujoy and Didar and brought them to the police station. 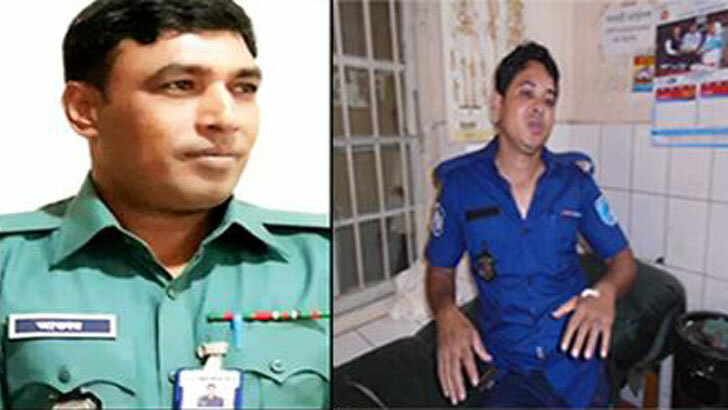 The injured police officers Mamun, Abul Bashar and Imran were rescued and hospitalized at Atrihazar Upazila Health Complex. At around 12 pm, Akhtar Hossain, head of the Atyazar Police Department, said the case was prepared for the whole event. However, the speech of OC Akter Hossain changed after Chathra League leader Sujoy and activist Didar were released in the afternoon. ASTI Mamun was injured and two security guards were injured in the Azadpur upazila health complex. When the whole event spread, there was serious anger among the police. ATS, attacked by attackers, told Mamun Jugantar: "For a few days there was a long-standing eve-teasing claim around Gopaldi. We arrested Didar on Wednesday morning and took him to an investigation and asked him to call his parents, Sujoy was rude and asked who arrested Didarake when he said I was arrested and he told me that you are getting a lot of courage to take her away. Immediately upon arriving at me, I was thrown into the punches, threatening to blow out the streets, and shooting them down, followed by the two magistrates, and Sujey and his men knocked us down. When asked about the release of the two detained, Mammon said why he was released after the attack on the police, it does not come to my head. Senior management is the best. He said he wanted to raise the case but now he can not say anything. I was admitted to a private hospital. OC told Akhter Hossain, "I had a misunderstanding with Akhter Hossain." There was no incident at the investigation center. What happened at Nazrul Islam Babu College? Tomorrow MP went to Sab America. There was a misunderstanding. But if the incident did not occur, why did the three police officers go to the Ministry of Health and Welfare? Without giving an answer to the question, OC was angry and did not speak on the phone and came to the police to deliver the news. Century of the Kohli Fly! This time Rituparna opened his mouth for Ferdous. Sadah Khamedes does not return because of this. Sonagazi Islami Senior Fazil Madrasa canceled the management committee.